There are three types of seepage water. They are seepage water from lack of velocity, seepage water from a hillside spring, and seepage water from a high water table. Detailed descriptions of each of these can be found in “Analyzing Drainage Problems and Applying Proper Drainage Techniques.” The reason that it is necessary to distinguish between the three types of seepage water is that each water type requires a different installation depth to be effective. This article will focus on the third type of seepage water, which is seepage water from a high water table. The permanent water table is called the “Phreatic water table,” and is the level where all of the pore spaces are filled with water. The height of this table will fluctuate with tides and precipitation. However, saturated zones can exist on all properties, even in the mountains, and can have the same effect as a phreatic water table. These types of water tables exist in what is known as the Vadose zone. The Vadose zone is the unsaturated zone. 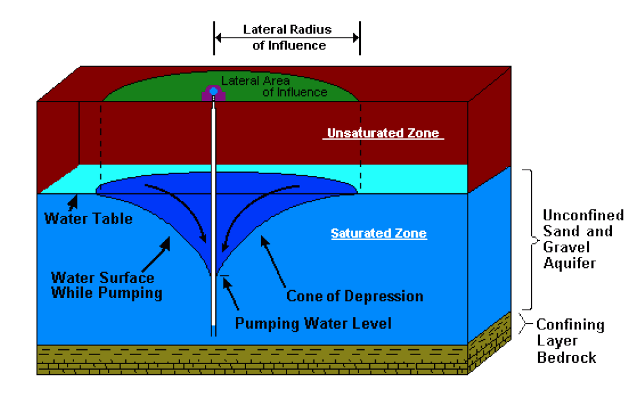 So a water table in this zone is a saturated area within this unsaturated zone. These are usually formed as the result of low permeability layers in the unsaturated zone that are then influenced by a body of water, such as a lake, seepage from a steam, or an accumulation of rainfall or snow melt. If the water table is far enough below the surface, it won’t present a problem in terms of playability, or the ability to grow turf. However, when a fairway surface is close enough (low enough) that the water table has an influence, it can either create a problem seasonally or year around. If a fairway is so low that its surface, or the rim elevation of a basin, is actually lower than the top of the water table, you may see water actually standing over the grate. 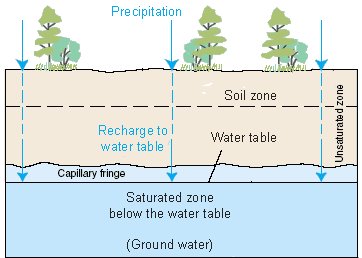 On top of a water table is an area that is called the capillary fringe. The capillary fringe is considered to be in the vadose zone, and its height will vary depending upon soil types. The finer the type of soil, the higher the rise of the water. The capillary tension that creates the rise is a negative hydraulic force that is stronger than gravity. 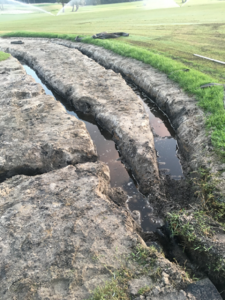 Now we will look at the three main reasons that drainage installation in high water tables fail. The first is that often people try to drain the water table to the body of water that is influencing the water table. 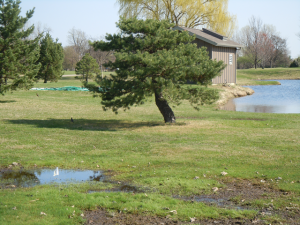 A fairway that has a high water table from a surrounding lake cannot be drained to that lake; it can only be drained to an elevation that is lower than that lake, or a pump. Only by draining water to an airspace that is lower than the water table can the drainage create a cone of depression in the water table. The second reason that causes failed installations is trying to drain down to just above the water table, and placing the drainage in the capillary fringe. As described above, the force that creates a capillary fringe is a negative hydraulic force that is stronger than gravity, and therefore cannot be directly influenced by seepage drainage. Lowering the water table itself is the only thing that can lower the capillary fringe. The third reason installations in water tables fail is drainage is placed too far apart for the cone of depression from one part of the system to overlap the cone of depression from another part of the drainage system. The higher the permeability of the soil, the more vertical the “V” that is created in the profile. Therefore, although it is counter intuitive, this means that the drain lines must be placed closer in a sandy soil than a clay soil. To influence the entire area that is to be drained; the point that the cones of depression overlap must lower the water table enough, in order that the top of the capillary fringe is below the surface; far enough that the turf can be maintained properly. 1st Qtr 2014: Tech Section: Could this be why your green does not drain? Can you raise your drainage basin in 10 seconds? Fall 2012: Where are the drain lines?